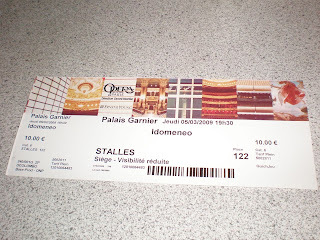 Malin is going to see an opera at Palais Garnier, the old, beautiful operahouse I showed you some pictures from! This will take place next thursday :) Almost everything was sold out but there were some tickets left to this opera, Idomeneo, by Mozart and then a ballet. The weirdest thing was that we had to chose between a seat from where you wouldn't be able to see anything at all and another seat from where we'll see a little. So we took the more expensive ones and are now hoping that we're going to be able to see at least a small corner of the stage! This is also why we chose the opera in stead of the ballet... There's no point going to a ballet if you can't see the dance. In a opera you can at least hear what they sing. Why do they even sell seats like this? Or the places probably behind a pole where you can't see anything?! Don't understand... :) But at least we now got a chance to see a show at the opera! And guess what else? 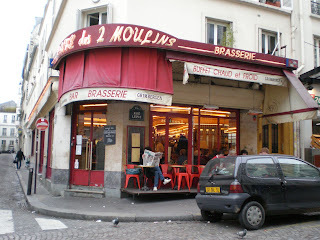 Now I've finally visited "Le café des deux Moulins" from Amélie! Yay! I've walked past this place a few times already but I had never entered it till now. 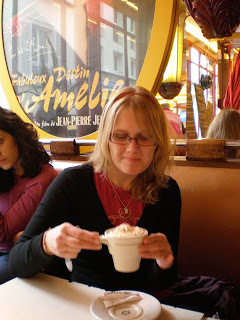 Can't wait to get back home and watch Amélie again! Hihii!